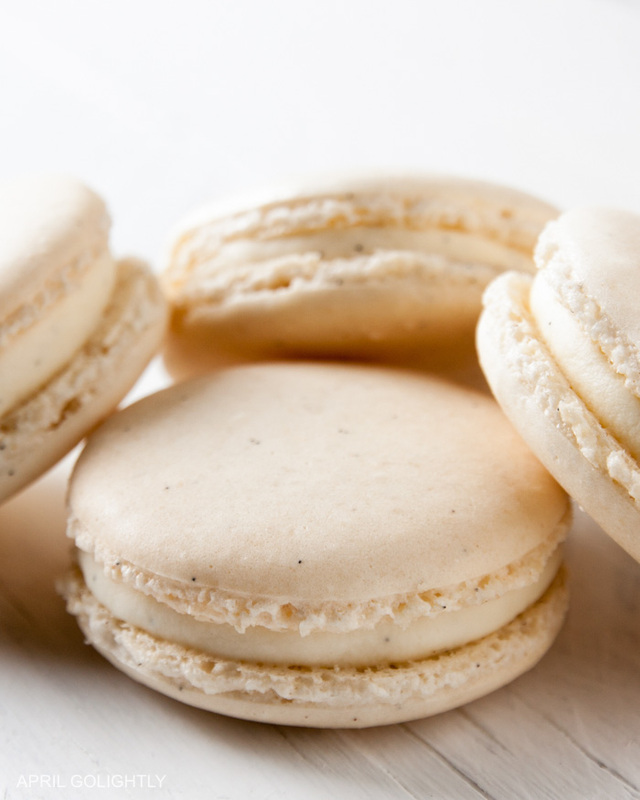 Create some absolutely beautiful and delicate vanilla macarons. Not only do they show off nicely, but they taste like Heaven. You know what I love most about macarons? How beautiful they are. They really show off so well. You can change up the colors and photograph macarons in every shade of the rainbow. They are delicate and oh-so-amazing. The first bite is a light and flaky cookie. As you continue to eat them, you discover the sugary filling which is basically sugar, egg whites, and vanilla. The substance of the macarons is in what you don’t experience: heavy flour or a filling that is overly rich. These are pure perfection. I love making them for my family and seeing them disappear. It just means I have to make more. Don’t confuse macarons with macaroons. It’s easy to mistype them, but they are very different to make and eat. A macaron has an egg-shell like crust and is filled with a meringue or buttercream. A macaroon is chewier, with lots of sugar and normally features coconut. To make these macarons, I recommend getting a pastry bag fitted with a 1/2-inch tip. If you don’t have one, you can either spoon round dollops of batter onto the baking sheet or make a pastry bag by snipping off one corner of a large resealable plastic freezer bag. Are you ready for my recipe? Here’s a printable recipe card. Don’t forget to pin this post so you can find it again. After making these once you’ll want to make them for lots of other events. Super easy French Vanilla Macarons that will impress your family and friends. Put powdered sugar, almond flour, and salt in a food processor pulsing several times. Continue for about 30 seconds or pulse until the ingredients are fine and well combined. Using a flour sifter, sift the above ingredients into a large bowl. Set aside. Place the 3 egg whites in the clean bowl of a stand mixer fitted with a whisk attachment. Beat on medium speed until opaque and foamy, about 30 seconds. Now add a pinch of cream of tartar, increase the speed to medium-high, continue to beat until the egg whites are white in color and hold the line of the whisk, about 1 minute. Continue to beat, slowly adding the granulated sugar, and vanilla extract...until the sugar is combined, the peaks are stiff, and the whites are shiny, about 1 minute more. Do not over whip. Transfer the meringue to a large bowl. Bake cookies, 1 sheet at a time, until firm to touch in the center and dry and cracked on top, about 7 minutes ..... pull the pan out and then rotate and bake for another 7 minutes. Want more baking inspiration? Here are some of my favorite recipes. Where is the recipe??? It will not open. These look so pretty! Yum! Pinned! Thank you for sharing on Merry Monday! We hope you will join us again next week! Just pinned to make later! I loove vanilla macarons! Is #7 and #9 the same? Should #7 be omitted?